Inaugural Middle School Wellness Week a Success! 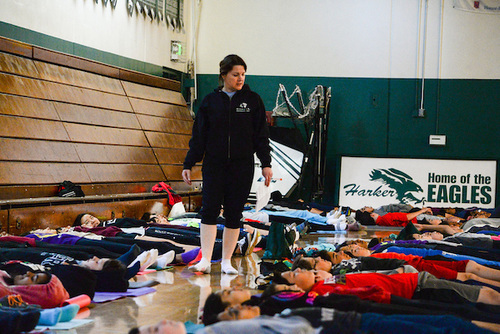 In an effort to educate the middle school community about the importance of “wellness,” the campus held its first Wellness Week just before spring break. The wellness initiative also focused on reducing stress through meditation and yoga, as well as the importance of diet and exercise to both physical and emotional well-being. The students enjoyed participating in yoga and meditation workshops. They were also given free-dress days and encouraged to wear clothing that allowed for freedom of movement. “The student council president and vice president brought the idea (of relieving stress) to the school after attending a Challenge Success conference. We then expanded that idea to also include community wellness, and acceptance and appreciation of diversity and empathy,” noted Cindy Ellis, middle school head. To that end, the students held lunch “mixers” around such topics. At the end of the day, parents were invited to come early to participate in their own activities around the same communal outreach themes. The Wellness Week was unique in that it incorporated both physical wellness and outreach-oriented facets. Many middle school teachers and staff assisted in the week by supervising, participating in or leading various activities. Wellness Week proved so successful that it is now slated to become an annual tradition.